The title is sometimes referred to as "Moles & Avocadoes" since it's easier to pronounce this way. 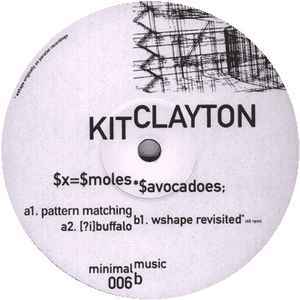 This is one of Clayton's more dancefloor-friendly releases. Nice driving minimal tech-house on the a-side. "WShape Revisited" on the b-side is a long minimal track that syncopates 2 simple gamelan-like percussion samples against each other while a 4/4 kick slowly creeps in behind them. The sparse structure and dualing rhythmic elements create a nice hypnotic mood with just enough tension and swing that it could work in a minimal dancefloor set as well.